​Profile: Via Luigi de Maio is one of the most important arteries in Sorrento's road network but also one of the town's most famous sights when viewed from above in Piazza Tasso. This twisting road connects the town centre to the ferry and hydrofoil port in Marina Piccola making it accessible by car or bus. You can also walk along the road to reach the port, taking the vertiginous steps down from Piazza Tasso which becomes a decidedly less attractive proposition if making the reverse journey! Directions from Piazza Tasso: As mentioned in the description above, you can reach Via Luigi de Maio simply by walking down the steps from Piazza Tasso. This is a good way of reaching the port on foot but the steep steps can be tiring if coming back from the port. Is there anything you'd like to know about your forthcoming trip to Sorrento? If so, please feel free to send me, Dion Protani an e-mail at info@italyreview.com. 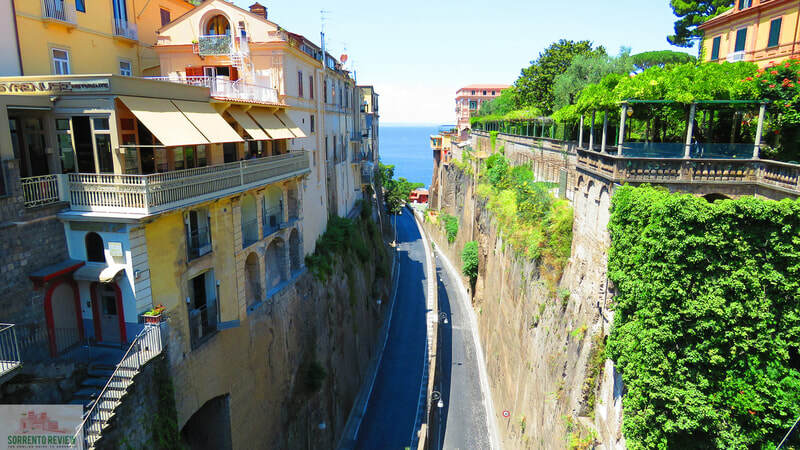 Sorrento Review is part of the Italy Review network of websites. Each site is written exclusively in English and provides travel tips and inspiration to visitors.